This post is about the planning stage of travel. How we do it and how you could do it. 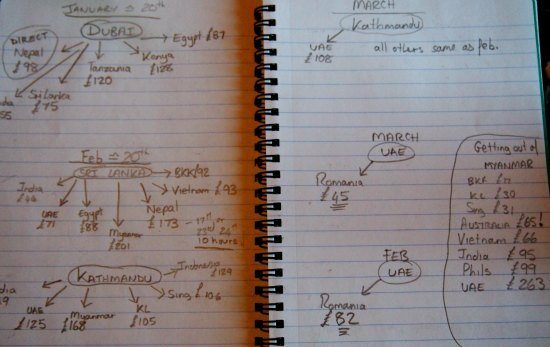 How to put together a big trip, be it a month, three months, a year or an RTW ( Round the World Trip). Some tricks and tips to put together a trip and arrange flights, accommodation, tours and more. A round the world trip is a little different in that you have to weigh up the pros and cons of booking a round the world airline ticket, or taking individual flights, we’ll talk about that further down the blog. But first lets look at how we planned travel in India, Sri Lanka, Nepal and more, from Europe via Dubai. Use our blog index tool below to help you find the sections you need. Round the World Ticket or Individual Flights? Booking Accomodation, How and Where ? Booking Accomodation in Advance, or as You Travel? Planning a Big Trip, Our Way. 1.Decide when to go, roughly, then look for a great deal. 2. Decide which country or countries will be the main focus of your trip. 4. Plan more or just go. 5. Let’s book some more flights and do some more planning. 7. Plans become concrete. Book more flights. 8. Booking accommodation, you don’t always have to. 9. Deciding where to go within each country and how to get around. You need to make one big important choice. Will you buy an RTW ( Round the World) airline ticket, or take individual flights, either booked on the fly, or booked in advance. 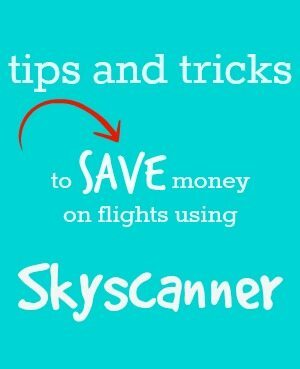 My advice would be to get a price on an RTW ticket, then use a tool such as Skyscanner to see if individual tickets would be cheaper. An RTW ticket may be more convenient for you if you want a fixed schedule, but if you want to retain flexibility, go with single flights. We’ve done it both ways and we prefer keeping our freedom. Remember that booking ongoing flights as you travel can be very time consuming, even stressful and relies on you having good internet. We still prefer to do it this way because sometimes we want to stay longer, sometimes shoot through fast, an opportunity could come up, a door may close. Who knows what will happen out there. Yu need to become well aquainted with the online hotel, hostel or guest house booking sites. The 3 big ones we use are Agoda, Booking dot com and Hotels Combined. You will probably find a favourite and stick with it. You’ll become so used to their interface that you can find a bargain in exactly the right spot, with exactly the facilities you need, in 10 minutes. Any of these 3 is fine but Agoda are our go-to site for Asia as they are local specialists. They also hand out credits to use against future stays. We had a whole free week of hotels recently because of our Agoda credit accumulation. We long term travellers are the marketers’ worst nightmare, we actually use all those credits that most consumers let expire. Hotels.com also have a good rewards system, after 10 nights , your 11 th night is free with this platform, but you don’t need to go direct to the Hotels.com website, access it via Hotels Combined. Hotels Combined is an online comparison site, so it will search multiple booking platforms for you to find the best deals, Hotels.com is one of the sites it searches, you will still get your Hotels.com credits. Hotels Combined does not check Agoda, ( at the time of publishing this was correct, this may change in future) you need to check that one separately. Booking . com is another popular one but we often find them more expensive for Asia, while they are good for Europe or Australia. In the US you can’t go past Priceline. All of these booking engines list all types of accommodation, you don’t need to go to specialist hostel booking sites to book a hostel. Airbnb is another popular one. We find that Airbnb can be touch and go, we only recommend them for more expensive countries and, interestingly, Egypt. You can sign up for Airbnb here and receive a free credit. Checking all of these platforms each time undoubtedly wastes your precious time. We would suggest picking 1 or 2 favourites and sticking with them. If you’re arriving late at night, book somewhere. If you’re arriving in peak season, festivals or holidays, book somewhere. If, like us, you need a few days of breathing space on arrival, book somewhere. If you’re travelling in Europe, probably book somewhere. If you have small kids or hard to meet needs, book somewhere. Otherwise it is very possible to wing it and find a place to stay on arrival, particularly for lower cost hostels, hotels and guest houses. In all honesty, it’s rarely cheaper than booking online these days, so maybe just save yourself the hassle and book. Priceline works best last minute, you can use that one from your phone minutes before you want to check in. If you can’t afford travel insurance, you can’t afford to travel. It’s not there to protect your phone or camera ( although sure, if you can’t afford to replace them esily, insure them), it’s there to get you home or to the right doctor in case of serious injury or illness. You need travel insurance. The one we use is below, it’s actually specifically designed for long term travellers and adventure lovers. 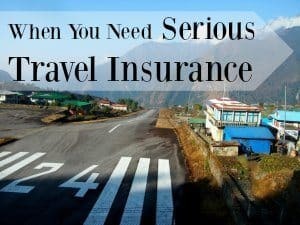 The only travel insurance we can use for our brand of travel, including this crazy airport in Lukla! We hope you have big travel plans for the coming year and we hope our website can help you get on the road. As always, don’t be afraid to ask questions in the comments, I’m here to help. Planning travelling is a fun part of the trip. You can spend months on this stuff and in the past we have, pouring over Lonely Planets and websites. But as we’re old hands now, after 3 years of travelling around the world full-time, we just get on with it. 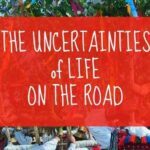 I thought I’d share our trip planning process to show you what goes into getting a family of 4 on the road, this time we’re not fully travelling around the world, our trip is just 3 months in Asia and Europe, but whatever length, it’s pretty easy, I use the information here to illustrate the process. The same steps obviously apply for singles or couple travellers, families are just more expensive! 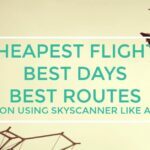 Mid January and Asia in mind we headed to Skyscanner to discover where and when would be cheapest. If you need some help with using Sky Scanner to find incredible bargains, click through, I’ve written it all up for you. We entered our preferred airport, Cluj Napoca, as the departure point and typed “everywhere” as the destination. For the date, we selected the whole month of January and checked “one way“. We looked at February too, but January came up trumps. It worked out best to get to a big air traffic hub, it often does, so we found a bargain flight to Dubai on 16th of Jan and booked it. We were about 3 months before departure and that is usually the best time. Our flight was just under £50 each. The same flight was selling for £300 in the same month. It really pays to look at a day to day comparison site. Once your departure flight is booked and paid for, it’s done, you’re going, no turning back now. This trip is all about Nepal. For us that was non-negotiable, everything has to work around that. Think about which places you absolutely HAVE to see, then structure your plans to accommodate them. Don’t skip places because they’re inconvenient or a bit expensive, you’ll kick yourself forever if you don’t go. Weather conditions mostly don’t matter, but just do a few quick searches. Arriving in India on the day the monsoon breaks isn’t a great idea and going to Chiang Mai when air-pollution is at its peak isn’t ideal either, but mostly, meh. You could just go. One way ticket in your hand, and make it up as you go along. We left Australia in 2013 with just a one way ticket to Malaysia and it worked out fine. The downside of unstructured travel is spending more travel time online planning your next move and less time enjoying your destination. The plus side is, total freedom and an ability to take bargains as they crop up. We wanted to get as much booked beforehand as possible this time, to be off the computers. We have never had any problems with not having an onward ticket before departure. If we were to run into difficulties, we’d buy a refundable ticket on the spot and cancel it later. Check regulations, for some countries onward tickets are not even required, despite what the check-in official may think. We thought about travelling to Oman from Dubai. We looked at accommodation prices on Agoda, checked that buses ran, costed out car hire and researched places of interest. But in the end we decided not to go. Why? Because the visas were expensive and getting there by bus, then hiring a car was a load of hassle. We decided that Oman will happen next time, we’ll fly into Muscat instead of Dubai just to make it simpler. Then we considered which order to put Nepal, Sri Lanka and India in. This mostly came down to cost and convenience of flights. We would normally overland between India and Nepal, but we’ve been warned against taking those border crossings due to current troubles. Also, the Indian e visa on arrival isn’t issued unless you arrive via specific airports. So we had to fly. This is what I did last night with notepad and laptop. I went back to Skyscanner, typed in UAE, Sri Lanka and Kathmandu, destination “everywhere” and looked at our options. Flights from UAE to Nepal and Sri Lanka were both excellent prices, as was India, but we had to start either at the bottom or the top. We preferred to start in Sri Lanka, to leave Nepal until it warmed up, so we penciled that in. Next, how to get to Nepal? We could fly to India and then fly on to Kathmandu, or we could fly from Columbo to Kathmandu via The Gulf, for about the same price. This flight was 10 hours, with a stop in the Middle East, but, it was a good quality airline, with screens and food rather than budget flights. Hmmmm…not sure. Visas, everybody loves to hate them. 1 month visas, for all 4 of us, came in at $240 for India, $70 for Sri Lanka (kids are free), $120 Nepal. That $240 annoyed me. Last year we spent around $500 on Indian visas. India is my favourite country and the new e visa on arrival is a great step forward, but this time, we decided no. India will be another trip, probably a 3 month trip. Scratch India, take the luxury 10 hour flight. If you weren’t us, you probably should have looked at visas months ago. A very few countries can take weeks or months to approve and issue, we knew none of the countries we planned on visiting would give us any trouble. So we now know for sure that it’s Dubai, Sri Lanka (1 month), Nepal (1 month). We’ll be flying back via the Middle East, most likely Dubai, but maybe somewhere else, we haven’t got that far yet, Oman could still happen. Again, it will be down to what Skyscanner tells us. 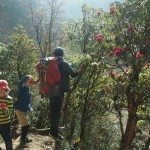 The March departure from Nepal is much cheaper than February, something to do with the climbing season,so that works out well too. We always use Agoda and we (almost) always book somewhere for our first night or two. Why Agoda? Because we collect their points and redeem them against future hotel stays and because their customer service is excellent. We’ve cancelled bookings many times and never had a problem. Agoda are THE specialists for Asia, but we also use them whenever we can for Europe, London, even the USA. With Agoda we can enter our exact requirements, 2 adults, 2 kids, 1 room and their ages. The ages are important because you will find kids stay free deals for all ages up to about 12. Another reason to travel before they are 12! We want freedom to travel around both Sri Lanka and Nepal in our own time, so we don’t pre-book much at all. Usually we just turn up in a town and go knocking on doors, don’t be afraid to do that. We’ve booked our entire stay in Dubai, Dubai is expensive. We’ve allowed 1 day for all the things we want to see and do there. We like to have a bit of a family discussion, see what everyone wants, we can work with that. You don’t need to plan too much, just go with the flow. We’ll read a Lonely Planet if we have one, we find it’s THE best way to get an idea of what’s available in each country and learn about the history, culture and food. We’ll maybe look at travel blogs of blogging friends we trust. We’ll use public transport or taxis, whatever works out best and cheapest. We’ll have some idea of where we want to go, but we’ll have no fixed itinerary. Packing for a longer trip is really not much different to packing for a week. These days we just throw whatever clothes we have into a bag along with a few essential travel items ( click through to see that post). Because we travel a lot we buy clothes that are multipurpose. Our bags will be full of jeans and long sleeved tops, they work anywhere, any climate. Clothes are available wherever you travel, packing is no big deal. For shorter trips, say 2-3 weeks, where multi-climate and multi-activity isn’t an issue, we now fly carry on only. This saves us money on airline tickets. You can read all about the pros and cons of flying carry on only in this post. It also contains tips on toiletries for carry on and ideas on how many and which clothes you actually need to fly carry on as a family. For longer trips we have things like sunblock, insect repellent, nail scissors, and penknives here at home, so I’m going to take them rather than have to scratch around and waste money on buying new at the other end. That’s our choice, you do what feels right for you. Choosing what baggage to take is an important part of your trip planning. My family always uses backpacks, suitcases on wheels wouldn’t work for us at all. We have a post on choosing travel pack ( my choice), backpack or suitcase to give you more help. For a 3 month trip I’m not packing school books, colouring pens, Lego, toys, all the usual stuff that we used to carry while travelling around the world non stop. That’s the beauty of having a home base now. We won’t worry about “school” at all while we’re away. We do take quite a few medicines in our first aid kits because kids always get sick when the shops are shut. Do you have at least 6 months left on all passports? Did you check if you need visas in advance? Did you tell you bank you’re travelling and tell them which countries. You don’t want your money supply to be cut off. Do you have spare bank cards in case of disasters? Do you have a house or pet sitter organised? Do you have a scan or photocopy of all essential documents? Email them to yourself. Do you have a few passport photos? 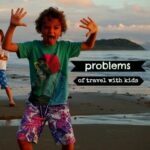 Do you have everything necessary to get your kids into some of the tougher-to-enter countries, particularly if only one parent is travelling? Have you checked baggage allowances for the airlines you’re using? Have you printed your boarding passes, hotel and car reservations? That’s about all I can think of for planning a big trip. You don’t need to worry about buying currency in advance, you don’t have to have everything planned, you don’t need traveller’s cheques, you don’t need clothes or gear for every eventuality. Just pack your bag and go. We’re off in 16 days. 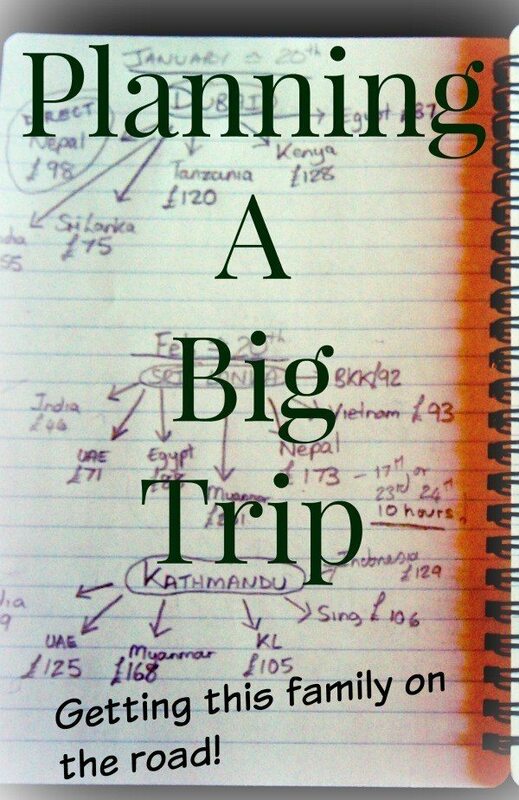 Not our biggest trip ever, but an exciting one, we’re itching to get back to Kathmandu. Are you planning travelling around the world in 2016? Tell us about it! One of the most informative and detailed guides that I have read on the matter. Thank you a lot for sharing it – really informative. I love this post – maybe the most useful I have read recently! Really you gathered everything that you may need for a family trip. Thank you for letting me know how helpful my guides have been! I am in South Africa for the second time now and I love it! For Dubai I booked the 4×4 with a group for the desert safari. For my day trip to Abu Dhabi we had a private driver in a regular sedan. I’m not sure what the saloon chauffeur is referring to but it sounds fancy. Have Fun! this is definitely something I am looking into… I have always had some burning questions though, if you wouldn’t mind me asking? Do you usually plan how long you will go for or do you go with it? How do you manage to get the time off work? Are your jobs flexible? Do you save in advance? What is your model when saving i.e. how much do you spend per day etc.? Hi Jessica. Sometimes we have a fixed duration( as with the above short trip), sometimes we just go and see what happens. We left home and my husband ‘s regular job 3 years ago now. We’re been making it up as we go ever since! I’m a travel blogger, I work as we travel and often travel is work. When we were saving, 3 years ago, I had a max weekly spend. I took out the cash each Thursday and any that was left over the following Thursday also went into the savings fund. All this is on the website, try this post. 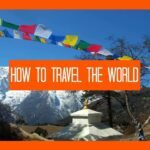 https://worldtravelfamily.com/the-money-to-travel/ I also found some creative ways to top up our income and we sold all our junk. This is one fantastic post. Thanks very much indeed. I’m past pre-contemplation and well into contemplation phase now! It is really powerful to see in real time, a woman and mother put her dreams into action and just get on with doing it. You’re bold, brave and living proof that one can drive one’s own route. I very much want to explore the world with my children and for a number of reasons feel it’s getting to that time. ‘Just do it already’ time. Your blog is a massive catalyst. My wonderful boys are aged 8 & 7. The elder is a natural for travel and thrives on pushing boundaries; the younger though is a real home boy. I’m mindful mostly of what they stand to lose if / when we go. I need to square that away and get comfortable with it. Flipping the argument it follows that ‘I have capacity to take them; so what do they lose if we don’t go? There clearly is so much to gain’. Currently I’m thinking one year, broken into 4x 3month chunks. I’d like to explore Australia (NE as a priority) & NZ; SE Asia; a little of the Middle East (my husband works in Saudi); and take a road trip through the national parks of west USA; Canada and Alaska also super high on my wish list. South & Central America and Africa are both missing eh? Well, I’ve had several years in Africa and the West Indies back in the 90s and you can’t have everything (ah! I can already hear disagreement!). I think I’m perhaps starting with the least threatening regions (as far as I can tell) as I’ll be flying solo with the boys through this trip. Almost certainly there’ll be several more iterations of this sketch plan before we finally style on a draft. But at this stage I just want to get this thought down & online, perhaps to make it real and tangible. The first step in a commitment. Phew! Does this sound ok? I’d be really ever so appreciative of feedback. Sounds perfectly tangible. Now you’ve put it in writing, you’d better do it J! An expensive year, but a good one. Not rich at all Sue. My husband works as a chef for less than half of the year, I make some money through the blogs. Travelling is cheaper than staying at home and is our priority, we go without “stuff” we don’t need or want to make the travel happen. It’s about lifestyle design. Sue, if we still lived in our own home, or even a rental, sure, it would be expensive as we’d be paying 2 sets of bills every day we were away. But as we no longer have possessions, bills or a real home base. It’s easy. Also, we don’t take “vacations” those involve spending a lot, we “travel” it’s different. My husband has just brought up this idea of packing up and travelling the world. My question is this, do you know anyone who has done it with little children? I have a 2 (and a bit) year old and 9 month old and I really want a third baby….am I crazy wanting to pack up and travel with kids this young? is it worth it or am I just borrowing trouble and stress? I am dual Aussie/Uk citizen and could get the same for my husband and children. Any advice would be greatly appreciated or any pointers to where I could find more info would be great! I know plenty Alisa. Check out other family travel blogs, the family travel with babies and toddlers blogs I like best are Flashpacker Family ( from New Zealand) and Travel with Bender ( from Australia) their children are a bit older than yours but still preschoolers. You’ll find quality information from experienced family travellers you can trust on those two sites. Tell them I sent you 🙂 It’s actually more common for people to do it with toddlers and preschoolers than with kids my age, because of school. Also check out Travel Deep and Wide. They have 9 kids and multiple special needs. I see you had Myanmar on your notepad. We just had two weeks there (family of 4) and LOVED it! Can be done cheaply and the country is stunning. We loved Sri Lanka too so reckon you’d get a lot out of a new destination! Yep, we’ll be planning a trip around Myanmar soon, that will take us over to BKK, probably Vietnam too. It didn’t really fit with this trip. Too many places, that’s the problem! A cousins’ reunion in St. Petersburg, Florida followed by 10 days in Hawaii for February (driven by a cancer research conference on Maui); Northern England in early May (driven by a mesothelioma research conference in Birmingham); London in September for a meeting of the European Respiratory Society, followed by a university speaking gig in Verona. It’s pretty clear that most of our travel is scheduled and planned around Mr. Excitement’s work travel, then I get to decide on where we go around his work days. I also use Skyscanner although we don’t usually have as much freedom about when and where as you do. I tend to use hotels.com or booking.com for accommodations in the US and Europe. I used Agoda for Japan jn 2010. Do you find Agoda as useful for non-Asian bookings? Yes, we almost always use it Suzanne. I don’t like hotels.com at all, they slap on extra charges at the last minute. Sometims we use booking, but it simplifies the process to just have 1 site to spend hours pouring over. This was a kind of throw-away post because I hadn’t publishes anything in ages Charlotte.It’s surprising which ones become popular. I’d better put it on Pinterest. It’s hard to remember that some of our readers will be totally new to trip planning. You should definitely check out Oman take the bus from Dubai to Muscat and after a few days take the bus to salalah as it’s very simular to Yemen without the conflict ,completely safe and probably unlike Asia. I would really like to see you travel outside of Asia and see your reviews . Look forward to hearing about your adventures. We will next time Sarah, but this one is about Nepal. We have travelled extensively outside Asia, every continent except Antarctica. The Middle East is Asia. Look forward to it. Asia is so big and vast especially In religion and culture be good to see you in other parts. I tend to agree, but we couldn’t find many alternatives. And when there were 4 to 6 of us, it got pretty costly. Which lodging sites do you use? I totally get not wanting to spend travel time sitting in front of a computer planning. My sister and I wasted half a day in Dublin doing that and it is SO frustrating. We had hoped to do all that in the evening, but we were always too tired after a full day out and about in new places. We didn’t like to plan for more than a week in advance, but we were going to a lot of different countries and not looking at all the alternatives could end up in extra costs.